In fact, especially from a distance, the patchwork layout of this bright patterned handbag looks more textured than over-the-top. The metallic red section of lizard print perhaps breaks up the muted color scheme, but it does add a fission of brightness and interest. It is, of course, very much a matter of personal taste, but fans of dramatic exotics may well find it to their style. 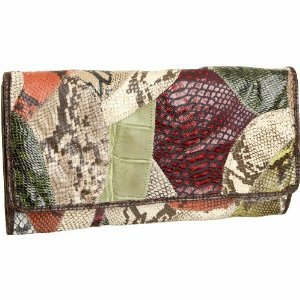 Aside from the interesting collection of textures and shapes, you have a basic envelope clutch here. You get a simple pouch and large flap closure, accompanied by a comfortable shoulder strap. The materials, of course, aren't luxurious, but this bag does only cost $69! You still get actual leather though! Interesting, unusual, and probably hated by many people out there, this multi-colored purse is an exotic choice! The Jalda Lizard-embossed brief clutch, a great alternative to this exotic bag.